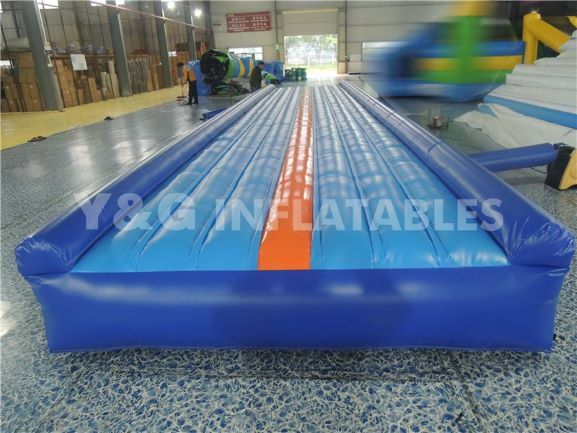 Nowadays, use inflatable gymnastics mat for gymnastics to work out is so popular, which also become one show-off equipment for people to post on facebook or on other social platform. When we mention inflatable gymnastics mat for home, what we first thing that comes to mind is gymnastics enthusiast who like to exercise at home. Because of the popularity of gymnastics,more and more people, whatever old or young, like to participate in gymnastics exercise on the air mat. Gymnastic exercise is not only a good way to improve physical function, but also increases self-confidence and willpower. The inflatable gymnastics mat is the athlete completes the movement in the air basic apparatus. Because soft inflatable MATS can provide a safe environment for athletes to avoid injury, with it you can safely practice gymnastics. But gymnastics has always been considered a high-risk sport, and safety is something to be concerned about, and there is no substitute for giving 100% safety assurances, as the air tracks does in gymnastics. Pango has designed many different sizes and colors of gymnastic pads, small in size and light in weight, especially suitable for family use. Of course, we also have specially designed gymnastic pads for professional athletes, which are more suitable for competitive competitions. These MATS are much stronger than we expected. An inflatable racetrack is usually used at school or home. Sometimes you'll find it used for martial arts and trampoline training.The multi-functional air gym mat is used in different purpose all because they can provide the fully-safe environment to the athletes. The surface of our inflatable gym mat is made of non-skid material so you don't have to worry about slipping and getting hurt while practicing.It's important to note that you can't exercise on an inflatable gymnastics mat with your shoes on, that's all.